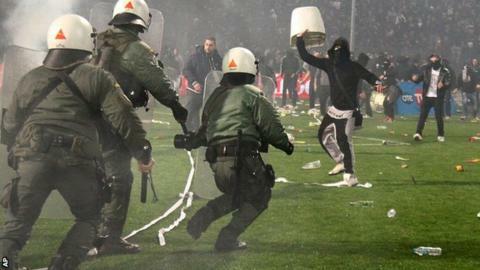 This season's Greek Cup has been cancelled by the government after the semi-final first leg between PAOK Salonika and Olympiakos was abandoned because of crowd violence. PAOK fans threw flares and clashed with riot police after their team was denied a penalty with Olympiakos leading 2-1. Greece's deputy minister for sport Stavros Kontonis recommended the suspension of all competitive football. But the Super League and other professional leagues will continue.